As part of Theatre Royal Bath’s Season of Contemporary American Drama, Donald Margulies’ award-winning black comedy The Model Apartment will have its UK premiere in the Ustinov Studio this autumn. Directed by Laurence Boswell, it stars Diana Quick, Ian Gelder, Emily Bruni and Enyi Okoronkwo. The Model Apartment runs from Thursday 22 November – Saturday 22 December. For more information and to book tickets, visit their website. Tomorrow (Tuesday) Serbian pianist Branka Parlic performs a concert of piano music by Philip Glass at Liverpool Hope University's Capstone Theatre. The concert will include selections from Glass’s 20 Piano Etudes, Dreaming Awake, and Wichita Vortex Sutra, which will be performed along with actor Lee Burnitt's narration of Allen Ginsberg’s anti-war poem. 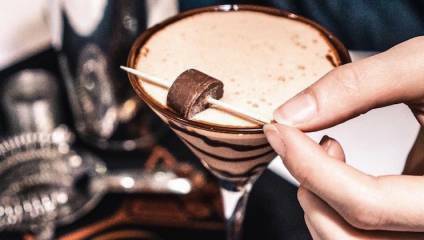 After their summertime pop-up got Covent Garden all shaken up, the Chocolate Cocktail Club is flying south for the winter to Brighton’s Vine Club, which is located in Vine Street in the lanes of Brighton. The Christmas menu includes a Christmas Chocotini, Merry Mocha, Banana & Cinnamon Chocolate Split and many more chocolate-inspired blends. For those who don’t have a sweet tooth there’s also festive fizz and bottled beer. This is a ticketed event costing £10 for 1 hour 15 mins, which includes a free Christmas Chocolatini. The American Museum & Gardens near Bath is launching an immersive Christmas experience on Thursday (22nd November). Working with The Natural Theatre Company the museum will be bringing its period rooms to life with actors and Christmas decorations, which show how early America kept family and friends cosy in the winter months. Events include a weekend Christmas Craft Fair, traditional Christmas wreath-making, and a ‘winter’s trail’. The Museum will also host a 17ft tall Christmas, and dogs are welcome! ‘’Tis the season – Keep cosy this Christmas’ runs from 22 November – 16 December. For more information, see here. New Adventures' production of Matthew Bourne’s Swan Lake swoops into The Lowry from Tuesday 20th November to Saturday 1st December and features a strong line up of local talent. Greater Manchester dancers Shoko Ito, Andrew Ashton and Isaac Bowry are making their debut with New Adventures, while Parsifal James 'PJ' Hurst returns to New Adventures having previously performed in Swan Lake in 2013. The tour continues at venues across the UK until May 2019. To book tickets for Swan Lake at The Lowry, visit their website. To book other venues, see the New Adventures website. The League of Gentlemen's Mark Gatiss dons crown – and straitjacket – for the infamous title role in The Madness of George III at Nottingham Playhouse, which you can also catch as part of NT Live on Tuesday. Read our review of the production here. For more information and to book tickets, visit the Nottingham Playhouse website. For NT Live, see here.